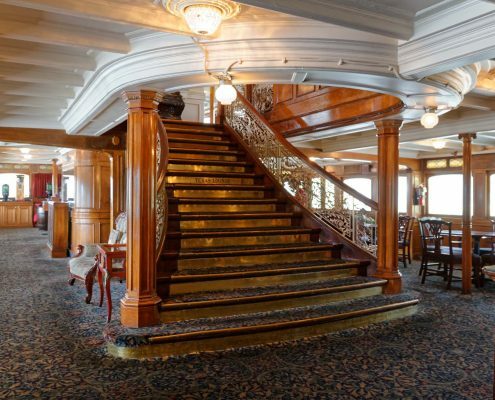 Stepping aboard the Delta Queen is like stepping back in time, the rich oak and mahogany interiors are equipped with spacious lounges, catering to your every mood while making you feel right at home. The outer promenades are equipped with plenty of rocking chairs to allow you a place to relax and watch the river and wildlife gently pass by. On the Texas Deck bow of the Delta Queen you will enjoy a large open space with plenty of tables to enjoy the afternoon sun. 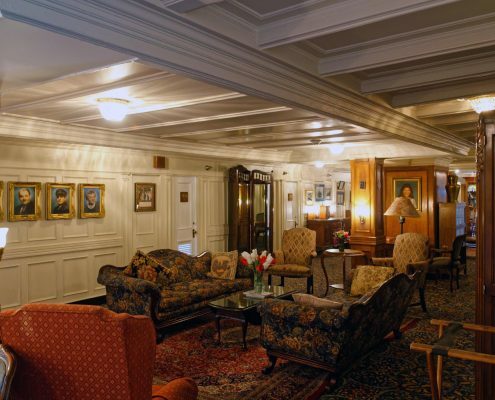 The Forward Cabin Lounge™, home of the Delta Queen’s picturesque Grand Staircase, provides for an excellent gathering place for you and your fellow passengers whether preparing to head out for the days adventure in port, gather before a meal in the Orleans Room™, or relax at a game of cards. 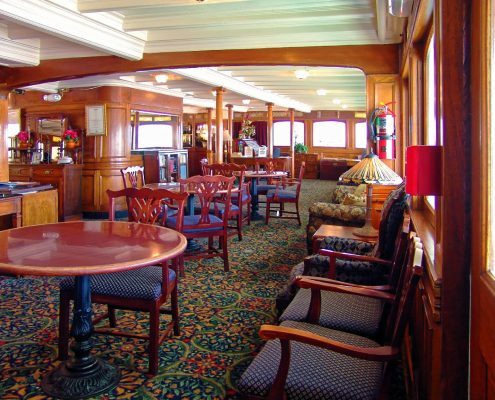 On the Cabin Deck bow, just ahead of the Forward Cabin Lounge™ you will find the Front Porch of America™, a place where you can take in the gentle breeze on one of the large wooden swings as the vintage 1927 steam engines steadily push you through America’s heartland. 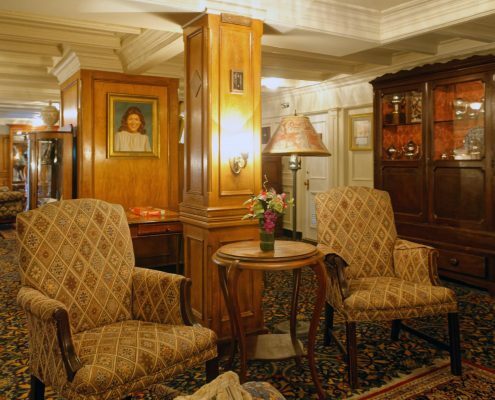 Down on the Main Deck you will find the Orleans Room™, originally the cargo deck when the Delta Queen first entered service in 1927. This area boasts exotic Siamese “Ironwood” floors tough enough to handle the freight of the day and automobiles, today they are brightly polished and adorned with ornate tinplate ceilings with crystal chandeliers. Breakfast, Lunch, and Dinner are all served in this large open space with windows looking out to the river on both sides. This will also be the place to catch guest lecturers and after dinner live shows. If you’re looking for some quiet time, the Betty Blake Library™ is the perfect place to curl up and read a book or work an ongoing jigsaw puzzle with your fellow passengers. 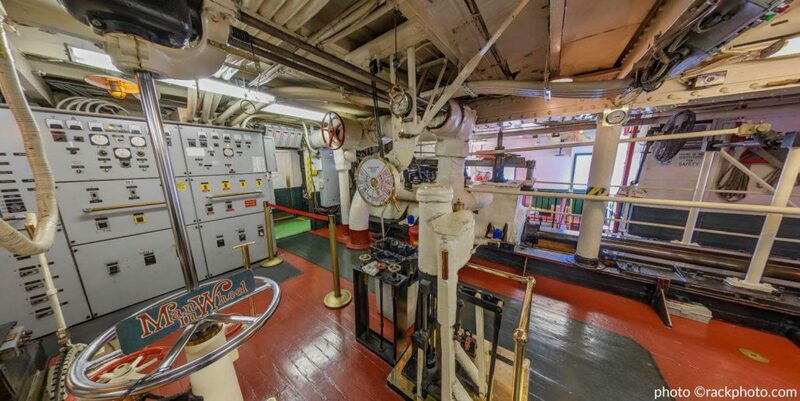 Take a guided tour of the engine room where passengers are able to meet the Chief Engineer and his crew as they operate and maintain the original steam engines adorned in polished brass that have propelled the Delta Queen for more than 80 years over several million miles of America’s inland waterways.